The Alaskan Klee Kai is a tiny dog that looks just like a miniature Husky. High-energy and alert, this breed is quite the handful compared to similarly sized toy dogs. Like many other northern breeds and small dogs, the Alaskan Klee Kai is quite the barker. These dogs can be suspicious of strangers but tend to bond closely with their owners. Smart and watchful, these little dogs are adept at learning tricks and keeping their owners entertained. Coat: thick but not overly long, downy undercoat; sheds moderately year-round. Color: this breed generally comes in the classic “masked” coloration with a darker top and a dark mask and white underside. The darker coat may be black, red, or gray. Life Expectancy: 12 to 16 years, generally; with such a new breed, life expectancy varies quite a bit. The Alaskan Klee Kai is one of the “youngest” dog breeds around. This breed can trace its origins back to a single woman, Linda Spurlin, who worked to create a companion-sized Husky starting in the 1970s after spotting what looked like a miniature Husky in Oklahoma. Rather than breeding extra-small or dwarf Huskies to create a small breed (practices that often result in unhealthy dogs), Spurlin “outcrossed” Huskies with smaller breeds like Schipperkes and Alaskan Eskimo Dogs. Spurlin originally called the breed simply “Klee Kai,” which means “little dog” in the Inuit language. 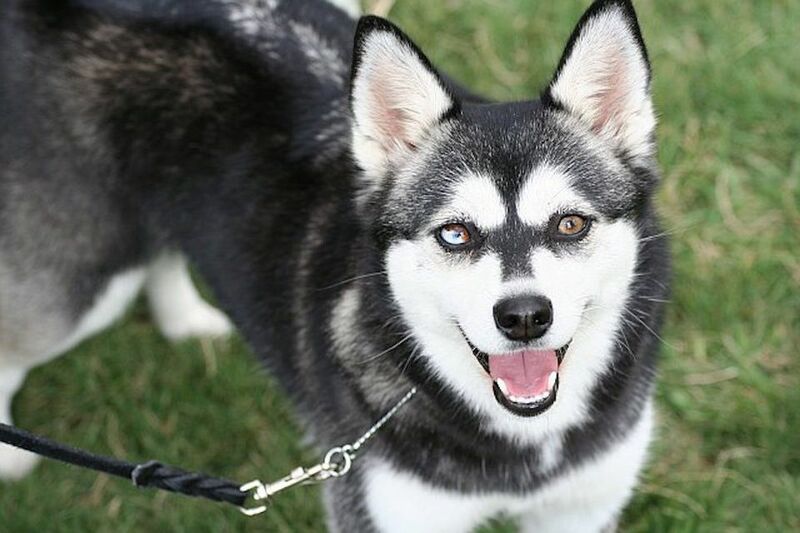 In 1995, the name was changed to Alaskan Klee Kai. This breed is still considered a rare breed and is not recognized as a separate breed by the American Kennel Club. The United Kennel Club recognized the Alaskan Klee Kai in 1997. From day one, the purpose of the Alaskan Klee Kai has been to be a cute, active companion for owners. Unlike the majority of older dog breeds, these little dogs were never meant to be hunters, farm dogs, guard dogs, or anything other than a companion. However, that doesn’t mean that they don’t enjoy “work” in the form of barking at strangers and training games! The Alaskan Klee Kai has been growing in popularity lately, as people notice the appeal of a smart, active dog that still fits into a smaller living space. This has led to some less-than-skilled breeders selling poorly bred puppies with pinched faces and bulging eyes that look more like fluffy Chihuahuas than miniature Huskies. Supporting a good breeder is important to keeping this relatively rare breed healthy going forward. Are Alaskan Klee Kais Miniature Huskies or Pomskies? While they look just like miniature Siberian Huskies, Alaskan Klee Kais are not just shrunken Huskies. They can also be easily confused with the designer mixed breed “Pomsky,” a cross between a Pomeranian and a Husky. Alaskan Klee Kai were created by mixing Huskies with smaller, but similar-looking breeds such as Schipperkes and American Eskimo Dogs. This resulted in a tiny dog that looks like a mini Husky but has additional traits (like the Schipperke’s desire to hunt mice) in the gene pool. All three of the breeds involved in Alaskan Klee Kais are bark-happy, thick-furred, curly-tailed, and pointy-eared. This breed is remarkably consistent in looks despite being relatively new to the world. This active little dog requires near-constant stimulation. Even active owners will find that Alaskan Klee Kai benefit from food dispensing toys instead of food bowls. Like many active breeds, these dogs often exhibit “contrafreeloading,” where they actually prefer to play games to earn their meals! A bored Alaskan Klee Kai can easily become destructive or vocal, so it’s important to exercise both his body and his mind. Alaskan Klee Kai are too small to join their human companions on long runs or bike rides—though hiking on-leash is a great idea. Instead, activity walks and training games are other great ways to burn off that Husky-like energy seen in these little dogs. Keep in mind that this breed can be difficult to train to come when you call, so keep yours on a long line if you’re not in a fenced area. Grooming an Alaskan Klee Kai is not a small task, but luckily it isn’t quite as extreme as grooming a Maltese or Akita. Thanks to their small size, these dogs just don’t leave as much hair on the furniture as a larger breed. While their fur is thick, it stops growing at just an inch or two long. Brush them several times per week, taking extra care to work out mats near their collar or harness. Good grooming habits will also reduce how much hair ends up on your furniture. Training these little dogs is often a joy. They’re quick to learn and smart as a whip, so be ready to keep up! Alaskan Klee Kai respond especially well to fast-paced, reward-based training games such as Ready, Set, Down after they’ve already mastered basic obedience training. These little dogs can be exceptionally barky or shy around strangers. Focusing on rewarding your dog for behaviors that you like and building up skills that are important for the AKC Canine Good Citizen Test can help teach your Alaskan Klee Kai how to behave properly in public and at home. If you’re getting frustrated with training your Alaskan Klee Kai, try to make the training scenario easier for your dog and reward his “good tries.” Don’t expect perfection right away and keep training sessions limited to just one to five minutes. If you’re getting frustrated, you can easily spook these little dogs and make them unwilling to train with you tomorrow! The Alaskan Klee Kai is a relatively healthy dog breed, probably due to its mixed-breed heritage. That’s good, since rare breeds often end up quite inbred because there just aren’t many potential breeders around. Like with many small dogs, the Alaskan Klee Kai is vulnerable to luxating patellas. They can also suffer from heart conditions, liver shunt, and cataracts. Some of these problems are best avoided by finding a good breeder and ensuring that they do appropriate health testing. Once your dog is already in your home, you can ensure she lives a long and healthy life by focusing on keeping her well-exercised and feeding her high-quality food. As an active little dog, Alaskan Klee Kai tend not to gain weight as easily as a lower-energy dog. Feed them an appropriate amount of high-quality dog food twice per day. They tend to do best when fed out of puzzle feeders rather than bowls, as this helps slow them down, exercise their brains, and burn off some excess energy. Avoid leaving food out all day or your little dog will gain weight! Get the advice of a veterinarian or canine nutritionist if you have questions about your Alaskan Klee Kai's diet. Is a Klee Kai right for you? Before you bring home an Alaskan Klee Kai, you might want to explore some other similar breeds to compare their personalities and needs. Be sure to speak to owners, breeders, and rescue groups and meet a few Alaskan Klee Kai in person to learn more. Otherwise, checkout all of our other dog breed profiles. There’s the perfect companion out there for everyone!